Stylized & Stenciled Spray Paint Portraits of Pop Culture Icons, Pets & More. Symbolic Upcycling with One-of-a-Kind Flair for Wall Art & Functional Items. The basis of upcycled art is a desire to give new life to old objects, often unrelated and reimagined in a new way. Of course, I find it equally clever when an artist repurposes related items such that the previous use gives meaning to the new form. Take for example, the work of Sivan and Josh, the creators of Sprayed Expressions. 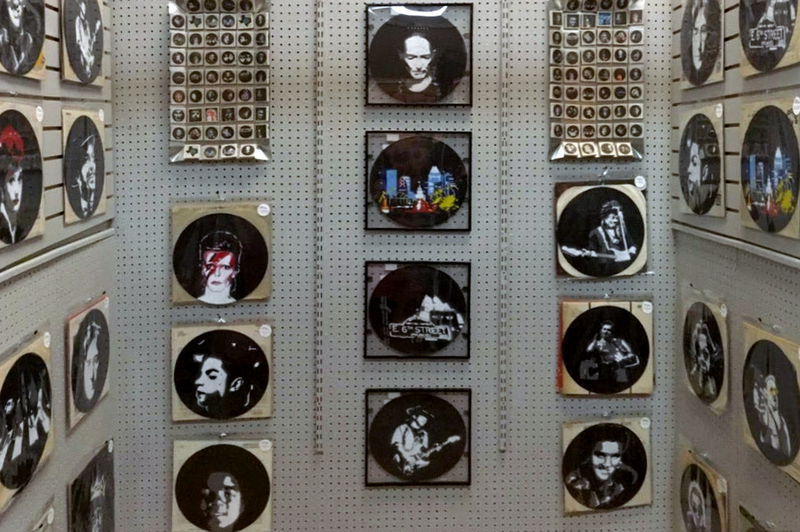 While their collection now includes a wide range of subject matter, what really caught my eye first were the portraits of musicians on old vinyl. What a smart way to reimagine records as a canvas for art! Such an iconic choice and sadly a somewhat dying media, for music at least. But there's more to the truly striking signature style of Spray Expressions. 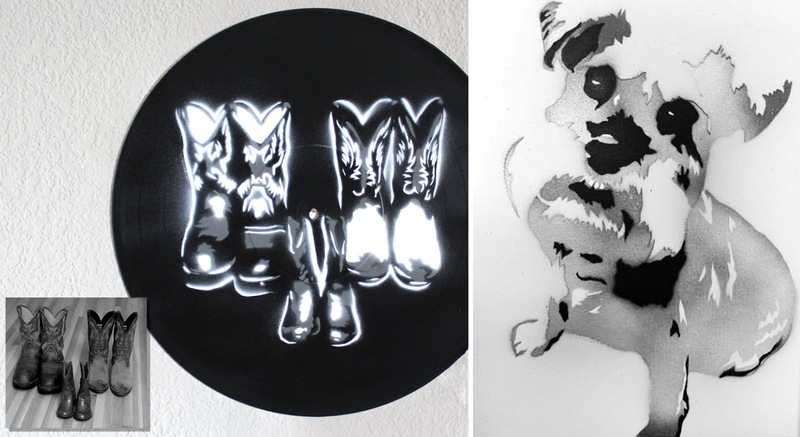 As their name suggests, these artists work with spray paint applied through custom made stencils. For each piece, they take an image and posterize it, which essentially renders the form in just a few colors, usually black, white and gray. By reducing the gradients they are able to define specific boundaries for each color that once layered on top of one another will create the image once again. This creates a striking effect! Once a piece is finished, Sivan and Josh decide how they want to reproduce it for other functions than simply wall art. 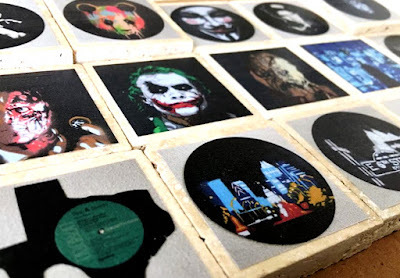 While you can get an original on vinyl, they also offer coasters, magnets, T-shirts and more. In addition to musicians, you'll find a variety of pop culture icons, nerd culture references and now custom pet portraits. 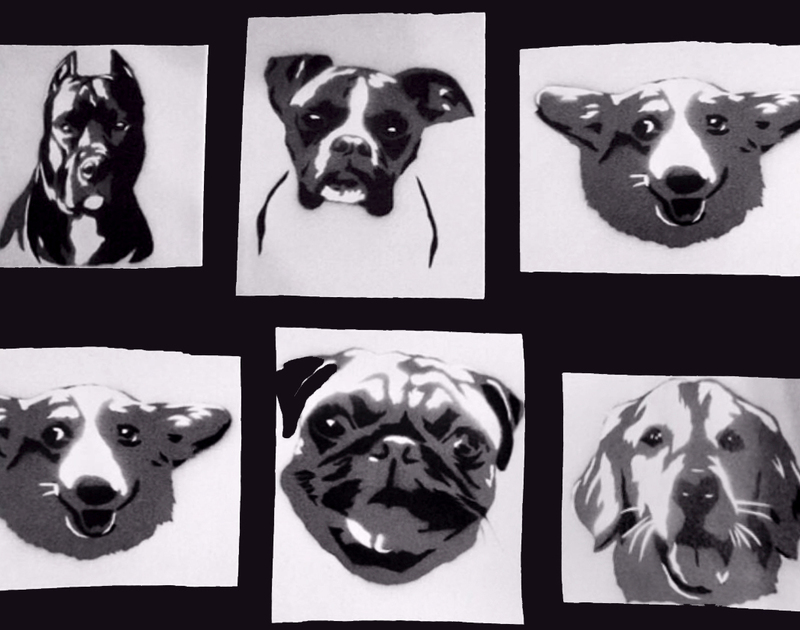 Spray Expressions can take pretty much any image and adapt it for stencils and spray paint. It's pretty cool to see! Plus, with such a characteristic style, these pieces go well together making easy to create a set. I love that they have new concepts at pretty much every show they do, but you'll also see the icons like David Bowie and Willie Nelson!